First-year bachelor of business administration (BBA) student, Leo Morjaria, asked for $50,000 for 15 per cent equity in his company Ultrameal – a Keurig-style system for breakfast meal-replacement beverages. Morjaria pitched that his idea would offer a healthy, low-cost, quick, convenient breakfast for the 40 per cent of millennials whom he stated do not eat breakfast on a regular basis. “Your breakfast of champions is just a button-push away,” said Morjaria during the pitch finals on Friday, Feb 2, 2018. For the last eight years, first-year BBA students have pitched their best business idea as part of the first-year, required business (BU121) course. 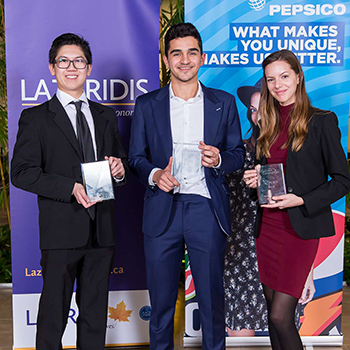 Sponsored by PepsiCo Canada and Lazaridis Economics alumnus David Chilton, the top 12 students benefit from a scholarship pool of more than $5,500. The pitch competition aims to strengthen students’ presentation and communication skills, introducing students to the ‘art of the pitch’ and to persuasion. The students have two minutes to pitch their new business idea to potential investors. Students have less than two weeks to prepare and to practice their pitch. “Every year I come here, I am more and more impressed by the pitches,” said Chilton before he delivered a keynote address to the attendees of the pitch finals, sharing stories of his experiences as a judge on Dragons’ Den. This year’s judges included Chilton; Alain Doucet, assistant dean of External Relations at Telfer School of Management at the University of Ottawa; Lazaridis BBA graduate Jeff Gadway, co-founder of Galvanize Worldwide – the world’s largest network of communications professionals; Anna Foat, former executive-in-residence for the Fierce Founders program at Communitech; and two senior executives from PepsiCo Canada Tolga Hocanin, director of finance and assistant controller, and Laura Gray, marketing director. Of the 1,200 BBA students enrolled in the course, 96 students were selected to compete in the semi-finals and 12 – the top one per cent – moved on to the finals. Second-place went to Trevor Chang whose idea, HawkEye, was to help “be your eyes in the skies”, connecting a mobile phone messaging app with easily-lost items, such as keys or identification cards. Tessia Orlandi was the third-place winner with her idea to “invest in everyone’s knight in shining armour, one extraordinary awakening at a time” with an alarm clock that uses gradual, soothing lights and vibrations. In addition to scholarships, the top three finalists will be interviewed for summer internships or co-op positions at PepsiCo Canada.